Keep our personalised Company 2018 Pocket Diary with you and you won't miss a thing! 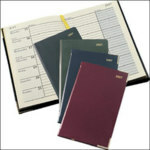 Customised with your Company's branding and logo print on the front of the promotional diary, why not hand out a batch of these fantastic corporate diaries and retain brand awareness 365 days of the year? Our 2018 Pocket Diaries are available in portrait or landscape style. Many different colours available, with or without gold corners. Your business details will appear in Gold blocked branding. All 2018 Pocket Diaries come with ribbon and cream or white pages. Customised pages can be added if required and all come with various additions pages such as, world maps, capital cities, year planner, useful numbers, underground map and bank holidays. Order a batch of our 2018 Pocket Diaries and you get your name out and about! Lots of different personalised and promotional gifts besides our 2018 Pocket Diary click here to view them all. So why not give our 2018 Pocket Diaries to your customers this Christmas and stay advertised.